To Receive Free Retail Display, order 10 each of item 48204. 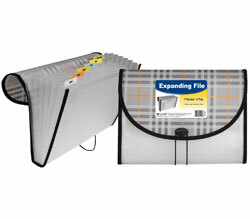 13-Pocket expanding file keeps documents organized. V-Cut dividers provide easy access. Wraparound elastic cord keeps materials safe and secure. Two-tone translucent, polypropylene finish. 13 clear pockets expand to hold important letters and documents. Includes 12 dividers with adhesive label tabs. Holds up to 350, 8-1/2 x 11 documents. Pink, 1/EA.